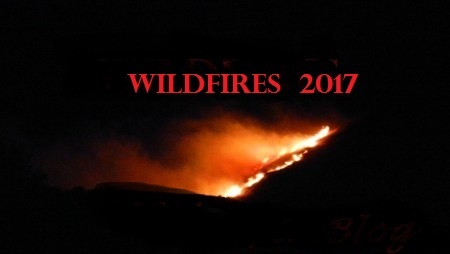 A wildfire broke out on Sunday, July 23, 2017, around 1900. Resources were dispatched at 1912 hours and en route at 1915 hours to the wildfire. The fire is located about 8 miles North of Hunters, Washington in very rugged and steep terrain. Fire fuels are timber, brush and tall grass. The fire is listed at 411 acres with a 10% containment status. Lead Agency: WA DNR – NE Region. There are approximately 150 personnel assigned to this incident. No other equipment or resources are known at this time. We do know that those currently engaging the fire are working tirelessly on fire suppression and containment efforts. American Red Cross (NW Chapter), Stevens County Emergency Services and Sheriff’s Office. About 25 area residents that are in the fire area were inside the fire area were under Level 2 and 3 evacuation orders. All orders have since been lifted. A significant power outage has occurred in the area and fire officials are working with utilities to get it back on. No ETA given as to when this will occur.